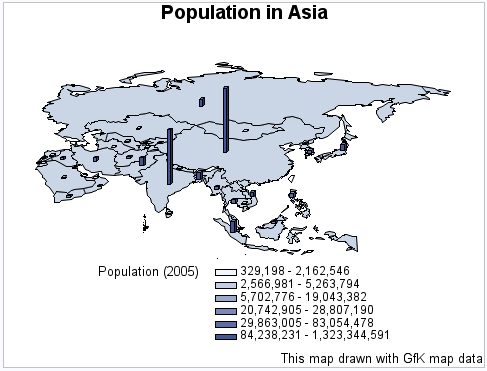 This example uses GfK map data to produce a block map that shows the population of countries in Asia. Since the DISCRETE option is not used, the response variable is assumed to have a continuous range of values. Because neither the LEVELS= nor MIDPOINTS= option is used, the GMAP procedure selects a number of levels based on the number of map areas. It then calculates the appropriate response levels. The elongated countries in the output indicate that GfK uses a different projection method than does output created with a traditional Asia map data set. Produce the block map.Specify the demographics table just created as the response data set. Specify a GfK map data set named mapsgfk.asia. The ALL argument specifies that the output should include all of the map areas from the map data set. The ID statement specifies the variable that is in both the map data set and the response data set and defines map areas. Note that the ISO variable is character. The BLOCK statement specifies the variable in the response data set that contains the response values for each of the map areas. The BLOCKSIZE= option specifies the width of the blocks. The RELZERO option specifies that the block values are relative to zero.